ANSI Z87 Apollos II foldable goggles with indoor-outdoor clear mirror lenses. Sporty style goggles. 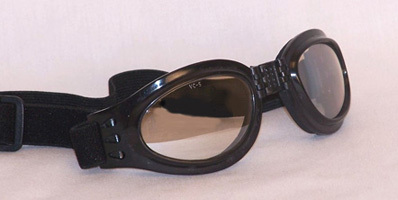 Hinged nose bridge makes goggles foldable. Polycarbonate lenses, each 2.125" wide by 1.375" tall. Vents on sides of frame to allow air circulation to minimize lens fogging. Padded eye cups.Black frame and adjustable black elastic strap. Meets ANSI Z87+ safety standards.